My grandmother “Mimi” died a number of years ago and though we never lived geographically close, we were close in the way that grandmothers and their granddaughters are. I idolized her and thought everything about her was mysterious and magical. Mostly I have all those homey odd memories about her that I collected over my childhood. She had curly white hair and wore enormous bifocals. Her house always looked exactly the same, year after year. Her bathroom was all porcelain and tile and felt wonderful on your feet as you walked in off the carpeting. She was a master knitter and all her knit things (we always got something hand-knit for Christmas) smelled a certain way—Woolite, my mother told me it was, which she hand-washed all her knits in. Her cooking was heavy on the baked goods (as a grandmother’s should be); she made these wonderful cookies every Christmas (Mexican wedding cookies) that were always just OUT on a table for anyone to snack on throughout the holiday but they contained nuts and as desperate as I was to eat them all, I actually disliked walnuts so much that I only ever managed to get through one or two. She lived in Tucson, AZ, and drove a car that had over the years all but disintegrated from the UV exposure. She loved the song by Stevie Wonder that went, “I just called, to say, I love you. I just called, to say how much I care…” and when I was in sixth grade it played on the radio all the time. We’d turn it up in the car and she’d sing along in her warbly voice. It’s funny how when you are a child, you have no concept of other people ever having been young. Or that they once had a different life other than the role you know them in, namely, “grandmother.” I always thought it odd that my mother was so testy around her. I only know snippets of her life now. She was born in a town in the midwest and spoke only German; she didn’t learn English until she was sent to school. She worked as a nanny when she was very young. She married an abusive alcoholic (my grandfather, a man I never knew, but who was a very well-respected lawyer) who was much older than she was. She never had a job after marrying until after he died, when she suddenly had, like, four—and she did a lot of volunteer work. And her hair was actually not naturally curly; she had it permed. After she died, my mother (the only daughter) was given her wedding ring. It was old and worn and bent so she sent it to me to make something with, using the diamond. This was a photo of her from her first communion, I think it was. Anyway, I had never seen a photo of her in her youth. Old photos are always so interesting—the people with their rigid expressions and fantastic outfits. When they are of your own grandmother in her early teens, well, I was pretty fascinated. 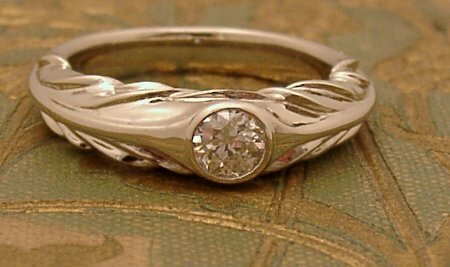 The whole feeling of that old photo of her inspired my design for this ring, from the ruffles of her dress and the off-tint color, to the art deco era. My mother now wears Mimi’s ring. Now I understand it was only a small piece of her that I knew. A fragment. I don’t find it sad or think it’s a bad thing though; her life was her own and I’m grateful to have participated in the parts that I did. This entry was posted on Saturday, June 26th, 2010 at 9:06 pm	and is filed under Misc ramblings, Rings. You can follow any responses to this entry through the RSS 2.0 feed. You can leave a response, or trackback from your own site. I cried a little bit too! Great post, it feels like touching a piece of ivory colored vintage lace. I noticed you on the front page of Etsy, realized you live in Portland and decided to read your blog. Your ability to honor, preserve, respect and carry on your Grandmother’s name is romantic and honest. This benediction for your Grandmother will live on forever!